Twenty-five years ago, events in Poland touched off changes that swept through Central and Eastern Europe, resulting in massive economic and political transformations. As the Polish economy emerged from decades of state control, industries were privatized and market-based competition was introduced, followed by painful reforms. Within a few years, Polish GDP and living standards began to rise significantly, as the country started on a growth path that has not ended. Accession to the European Union in 2004 confirmed the success of Poland’s effort and indicated a development path that was leading toward the level of Europe’s most advanced economies. Over the past 25 years, the Polish economy has doubled in size, as measured by real GDP. With regard to GDP per capita, Poland moved from 32 percent to 60 percent of the Western European average (EU-15),1 while annual GDP growth was 4.6 percent between 1991 and 2008. Poland was the only EU country to avoid recession as a result of the global financial crisis and is today the eighth-largest EU economy. Its impressive history of growth for more than two decades has left the country, long a marginal European economy, poised to become a regional growth engine. We believe that Poland now has the opportunity to make a strategic choice to determine its growth path for the next decade. Our new report, Poland 2025: Europe’s new growth engine (PDF–4.45MB), details two scenarios for the country during the next decade (exhibit). Alternatively, Poland can seek to accelerate development to become the fastest-growing EU economy for the next decade. 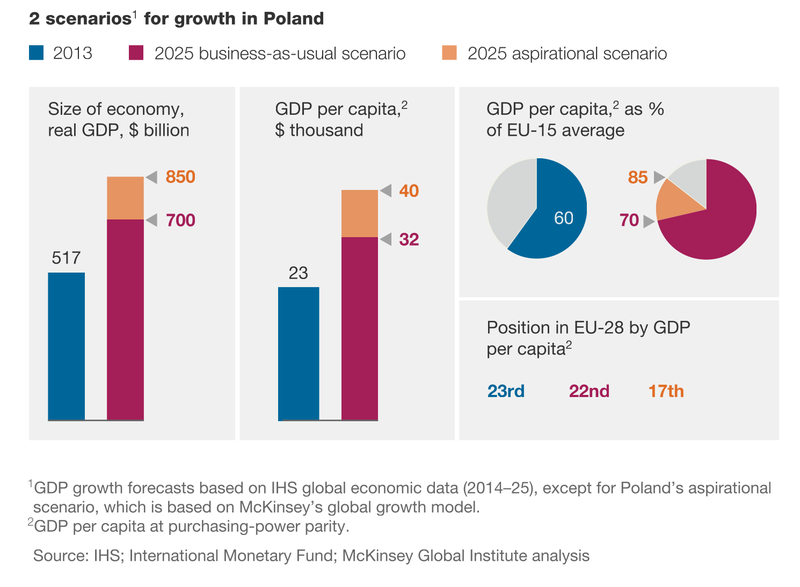 Under this aspirational scenario, GDP growth moves from good to great, topping 4 percent annually during the next decade and putting Polish per capita GDP at 85 percent of the projected EU-15 average by 2025. This would leave the country level not only with Cyprus and Portugal but also similar to Spain and even Italy. As a consequence, Poland would become a globally competitive advanced economy and a significant exporter of goods and services. While realizing this more ambitious scenario does not require Poland to abandon its existing growth model and the country’s current assets are sufficient to achieve it, it does require a powerful collective effort by both the private and public sectors. Since the country is already a developed economy, this accelerated growth will only be achieved through a major multisector transformation program in conjunction with further improvements to infrastructure, simplification of regulations, and investment in education and innovation. We believe the country has the means and resources to begin this new economic phase, transforming by 2025 from a regionally focused middle-income economy to an advanced European economy competing successfully on the global market. This article is excerpted from Poland 2025: Europe’s new growth engine (PDF–4.45MB). Wojciech Bogdan is a principal in McKinsey’s Warsaw office, where Daniel Boniecki is a director, Tomasz Marciniak an associate principal, and Marcin Nowacki a consultant; Eric Labaye is a director in the Paris office. The authors wish to thank Wiktor Namysl, Marcin Purta, and Ewa Szmidt-Belcarz for their contributions to this article.